This is integral to learning and teaching baby signing to your little one. It contains 150 signs for everyday life, organised into 11 categories, including a very wide range of popular animal signs. The sheets are double-sided and laminated (to wipe away any little ‘spills’) and all come in a handy folder. Each sign has a clear photograph, description and a space to chart your baby’s signing progress. There are also 21 ‘how to’ tips that cover areas such as when the best time is to start baby signing and why, what the best signs to start with are, who should be involved in the signing and lots of great ideas to make baby signing fun and part of your day-to-day communication. It’s essential! The TinyTalk interactive DVD is really something special. It has taken nearly 6 months to produce and doesn’t make any compromises. 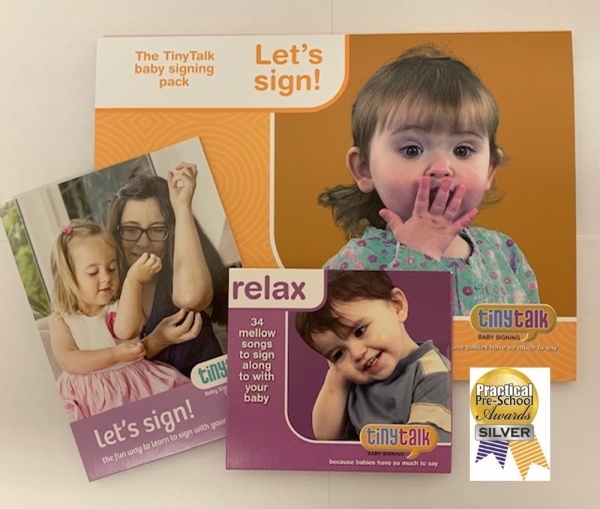 There are lots of songs performed in the class and on location, plenty of babies signing, parents explaining why they come to TinyTalk classes and sign with their children as well as 150 signs clearly demonstrated. Each sign is shown twice through and has its own beautiful piece of film showing the object in its natural setting: there are pigs in their pen and apples on the tree, kisses from granny and sleepy bedtime scenes. This movie is designed for you to spend time with your baby, talking through what you can both see. The DVD’s interactive menu also allows you to go straight to certain section, such as the songs or the signs. You can then click on your favourite song or signing category. This CD is what your baby has been waiting for. It has been designed especially for them. There’s no distracting background ‘music’. It’s just the sleepy songs on their own (all 34 of them), sung slowly to help little ones learn to listen and develop their language skills. The songs are also sung at the TinyTalk classes so the tunes, words and signs can all be reinforced (or practised) at home during the week. It has also been proved to be particularly effective on long car journeys. "I started using this product when my baby was 4 months old. 6 months on and we have a proper chat! Highly recommended." "I really like the fact that it is wipe-clean too as my son wants to look at it with his sticky fingers!" "It's really helpful to have a quick reference to check new signs and remind ourselves of ones we have learned in class." "I got this DVD as part of the complete TinyTalk signing kit and it is FAB!" "Excellent for teaching the whole family." "We put it on and watch together, practising our signs at the same time. We also learn new ones: 'cake' was a particular favourite!"